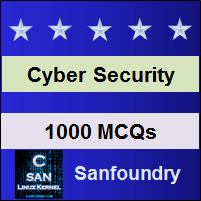 This set of Cyber Security Multiple Choice Questions & Answers (MCQs) focuses on “Social Networking Security”. 1. Which of the following is the most viral section of the internet? Explanation: Social networking sites are the most used sites and the most viral section of the internet. So users must keep their accounts secure and safe from getting into wrong hands. 2. ____________ type of sites are known as friend-of-a-friend site. Explanation: Social networking sites are the most used site which acts to connect people for social interaction. So users must keep their accounts secure & safe from getting into wrong hands. 3. Which of the following is not an appropriate measure for securing social networking accounts? Explanation: ‘Always maintain a soft copy of all your passwords in your PC’ is not an appropriate measure for securing your online accounts because, if your system got accessed by anyone or anybody put spyware or screen-recording malware, then all your passwords will get revealed. 4. Which of them is a proper measure of securing social networking account? Explanation: Never keep your password with any relevant names because there are different types of hackers who either use password guessing techniques or some of them are hard-working and they do social engineering and research on different data associated to the victim. 5. If hackers gain access to your social media accounts, they can do some illicit or shameless act to degrade your reputation. Explanation: Yes, there are script-kiddies or young-hackers who start their hacking career by cracking simple & weak passwords to enlighten their skills to others. These hackers may gain access to your social media accounts & can do some illicit or shameless act on behalf of your name to degrade your reputation. 6. ________________ is a popular tool to block social-media websites to track your browsing activities. Explanation: Blur is a free browser extension and a popular tool used to block social-media websites to track your browsing activities & prevent users from these surfing pattern stealers. 7. Try to keep your passwords without meaning so that _____________ attack becomes almost impossible to perform successfully. Explanation: Try to keep your passwords without meaning so that password guessing attack becomes almost impossible to perform successfully. This will reduce the potential to do both passwords guessing as well as dictionary attacks. 8. Keeping the password by the name of your pet is a good choice. Explanation: Keeping the password by the name of your pet is not at all a good choice. Because they do social engineering & research on different data associated with you as a victim and will perform password guessing techniques. 9. Increase your security for social media account by always ____________ as you step away from the system. Explanation: Increase your security for social media account by always logging out as you step away from the system. This will reduce both remote hacking as well as physical hacking. 10. Clicking on enticing Ads can cause trouble. Explanation: Clicking on enticing Ads can cause trouble. Viruses & malware frequently find their mode of entering onto the victim computer through these annoying & enticing ads. 11. Strangers cannot cause much trouble if we connect to them over social media. Explanation: Strangers can cause huge trouble if we connect to them or chat with them without knowing exact details or whether the account is genuine or not. The stranger may send infected links which you might click and will redirect you to infected sites. 12. Part of the social media sites are the various games & 3rd party applications which helps ______________ to get access to your data. Explanation: Part of the social media sites are the various games & 3rd party applications which help cyber criminals to get access to your data. In this way, they can compromise your account or grab your valuable & confidential data. 13. Many social media sites and services provide _______________ for legitimate account verification. Explanation: With 2-Step Verification (which is also known as 2-factor authentication), users can add an extra layer of security to your account. After login, it asks for your existing phone number to send an OTP for layer-2 verification. 14. Scanning your system and destroying suspicious files can reduce risks of data compromise or leakage of compromised data over social media. Explanation: Scanning your system and destroying suspicious files can reduce risks of data compromise or leakage of compromised data over social media. There are different website caches and bots that gets automatically downloaded to your system when you open different social-media sites and they store your sensitive data related to your social media account. 15. Different social media services offer tips as of how to use their services and site, still maintaining a high altitude of security. Explanation: Different social media services offer tips as of how to use their services and site, still maintaining a high altitude of security. Every user must use those links to educate themselves and learn various features towards social-media security.